So now I’m saying welcome back. It’s a new year. It’s cold. And I’m ready to open my embrace to the warm hug that chocolate provides. I’m ready for it to melt on my tongue. I’m ready for cocoa powder’s earthy depth; dark chocolate’s bitter, almost acidic, twang; and milk chocolate’s caramel smoothness. This chocolate dessert was the perfect place to start. It’s sleek not overwhelming, and also serves as a parting farewell to one of my favorite fall/winter fruits: the pear. Its a bridge between the two halves of my year in baking. Pears have just a couple more weeks before they will be stripped of their perfume and succulent juices. In a way then, this tart is a hello and a goodbye in one. And it nicely echoes my final chocolate dessert last spring: the Chocolate-Pistachio Tart, a real winner. The use of nuts is crucial to the success of both tarts. 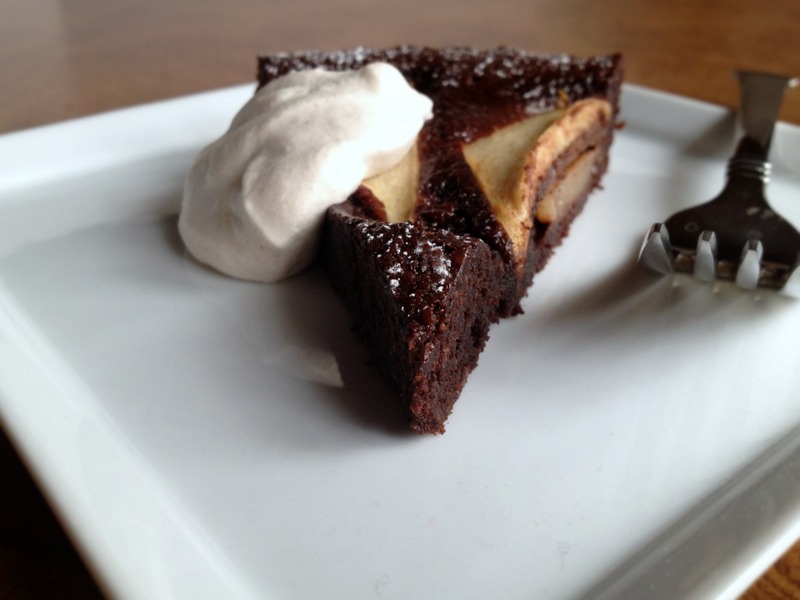 Pistachios pepper the crust of the Spring tart and make up a fragrant nut butter that rests under the silky baked ganache, while almond flour makes up the body of this (gluten-free) chocolate frangipane tart. They’re both slim and sleek. Swallowed by a pedestal, they do better on a flat serving platter. At the same time, though, both their appearance and their taste carry a presence. They’re rich and silky, but they have body. And they’re both brought to you by Martha Stewart’s New Pies and Tarts. A bite of this new tart, though, is quite different texturally. It can make even the most reluctant dessert eater swoon. It’s soft with the texture of traditional frangipane that walks the line between cake and custard and the smooth fudginess of a brownie. But it’s sophisticated, not playful, in its fudginess.Such a simple tart in both its ingredient list and prep manages to combine the dark, rich flavor of the cocoa powder with the sweet, floral flavor of almond, and the honeyed nectar of fresh pears, which bake without losing all of their bite as the whole tart puffs playfully up and around them. It’s the perfect was to say goodbye to good friends and hello again to new ones. Make it soon, before it is too late. I like to serve this tart with very softly whipped cinnamon cream s it just dabbles elegantly off the side of the tart. I love cinnamon and chocolate, cinnamon and almond, and cinnamon and pear, so it only made sense. But amaretto whip would be great, too! I’m linking to the recipe since the only things I did differently were to chill the filled tart pan while preparing the pears so the slices don’t sink into the batter so readily (this is thinner than traditional frangipane) and skip the glaze on the pears since I prefer a more rustic look. For my fellow scale-users out there, however, I have transcribed the ingredient list below. You’re right, we do have very similar tastes – this looks like my idea of heaven! I love frangipane but have never had a *chocolate* version. Wow. And yum. 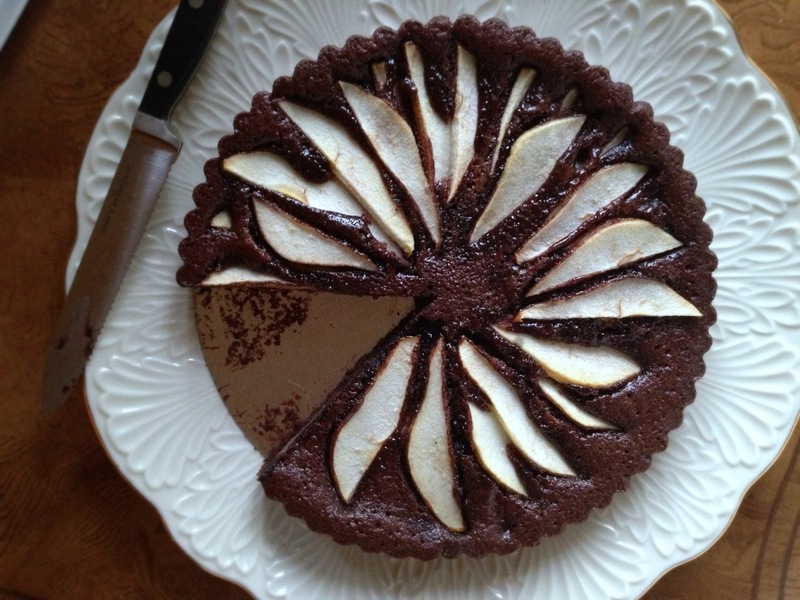 Welcoming chocolate back into your baking life is a big reason to celebrate, and this tart does seem like the perfect vehicle for it! Remember our chocolate/brownie texture talk the other day? I think this is exactly the texture I love… based on your description. And I think pears are underused in baking. So I love this tart all around! I don’t want my brownies to resemble cake in the slightest, but I do like them to have some chew to them that at least a little gluten development could yield. 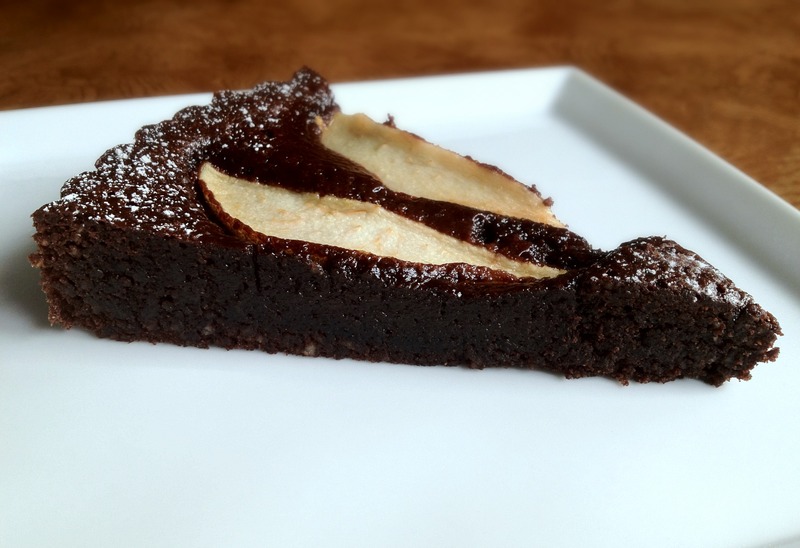 That being said though, I would not turn down this tart in brownie form! And I completely agree with you on the pears. I adore them! 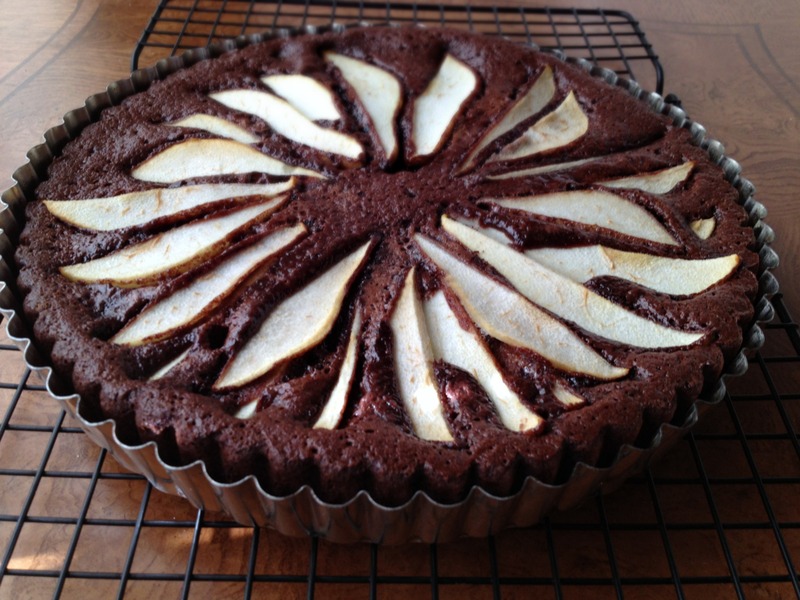 love pears… and this looks absolutely amazing. must make! my gosh, it’s like a dark beautiful heaven!